The Algarve sits on the southern coast of Portugal and is a firm favourite with British holidaymakers who enjoy the fabulous beaches, wonderful climate, the colourful resorts and the welcome from the friendly locals. Flights to Faro operate all year round from the UK making it a perfect place for a short break, a family holiday or a long stay winter holiday destination. You will never be bored if you are on a Algarve holiday, there is so much to do from great water sports, to water parks, golf courses and loads of fantastic beaches, this area of Portugal has it all. The beaches offer beautiful sands and gorgeous waters that sparkle in the bright sunshine, from hidden rocky coves to vast expanses of sand, you will always find somewhere from which to lie back and enjoy the heat of the day. The Algarve has a fantastic sunshine record and it offers one of the best climates in Europe. Winters are usually mild with average temperatures around 19ºc, there is a small chance of a shower during the winter between November and March. Summer months can see the mercury top 30ºc plus and there is plenty of activities in and around the resort to take part in. Many people enjoy holidays in the Algarve during the summer when all the resorts welcome tourists with open arms. The resorts differ greatly here from the big and brash Albufeira, the sophisticated Vilamoura to little gems such as Portiamo or Olhos D'Agua which are a lot more laid back. Many tourists who enjoy holidays in Algarve tend to head for the largest resorts of Albufeira and Vilamoura. Both resorts are family friendly and have lovely beaches (7 in Albufeira and 2 in Vilamoura) that offer watersports, and with plenty of shops, bars and restaurants on offer you will never be stuck for something to do. The Strip in Albufeira is a great place for a lively night out with plenty of music bars, discos and clubs to enjoy until the early hours. 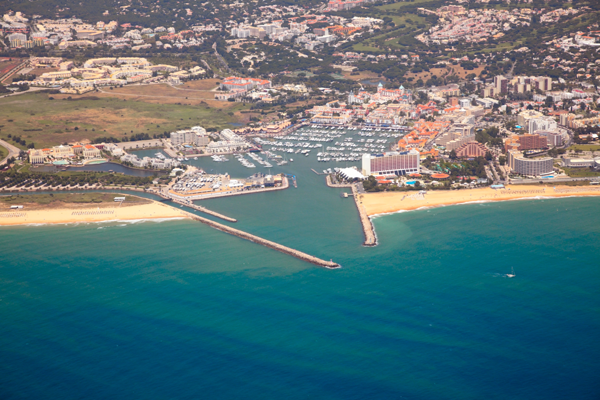 The promenade and marina in Vilamoura also offers a good selection of bars and restaurants to enjoy after dark. The main party nightlife can be found in both Albufeira and Vilamoura, however it is not too much in your face and both resorts cater really well for families and couples too. One thing all the resorts have in common is the great food on offer with an abundance of restaurants serving delicious locally caught fish or shellfish, there are also plenty of meat and vegetarian options on the menu. Most bars and restaurants on the Algarve are family friendly and offer kids menu's with traditional favourites that children offer. Mum and Dad can also enjoy a typically British meal or a local speciality, there is loads to choose from. A great way of getting to see the Algarve is to hire a car. The roads are very good here with excellent signs and getting around could not be easier. Drive along the coast and discover white washed buildings dotted in the hills right down to the beach. Traditional villages sell local crafts and goods and make for great places to get away from the heat of the day. Golfers are spoilt for choice with a large number of fantastic golf courses. Water sports are available on all the main resort beaches, from pedaloes to water skiing and everything in-between. Theme parks, water parks and go-karting are popular with families and can be pre-booked in resort. We have a huge choice of Algarve holidays just waiting to be discovered! Give us a call or have a browse around our site for more details today!